Every Wednesday, a new crop of comics enters this world and makes it just a little more awesome. Being a lover of comics in addition to a lover of love, I try to select one comic from this fresh batch that I feel offers the most awesome for just a few bucks. At a time when the economy is always on a verge of tanking, it’s hard to find a better value. This week’s pick was an easy one with “Uncanny X-men Annual #1” and not just because I’m hopelessly bias towards the X-men, in general. This issue marks a critical development in the overall landscape of the X-men and the Marvel Universe, as a whole. 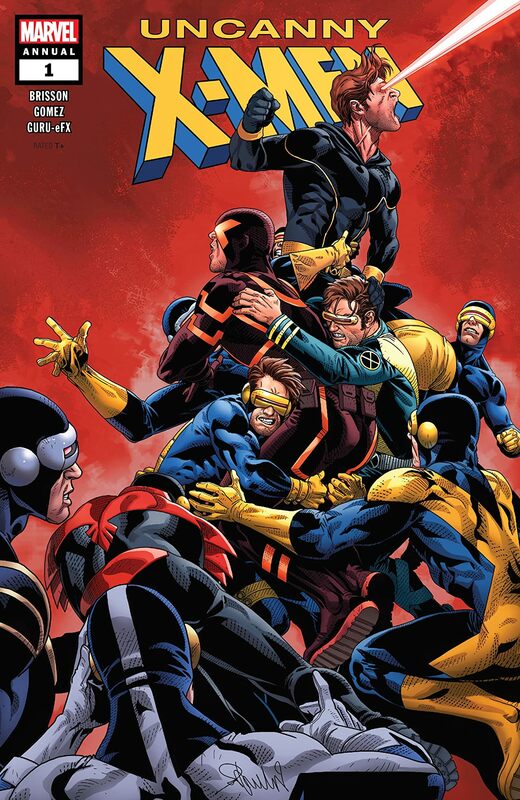 As the beautiful cover art by Salvador Larroca indicates, it’s all about Cyclops. That may not seem like a big deal for those who don’t regularly follow the X-men comics, but trust me when I say that this is a huge development. That’s because for the past three years, Cyclops has been dead in the X-men comics. 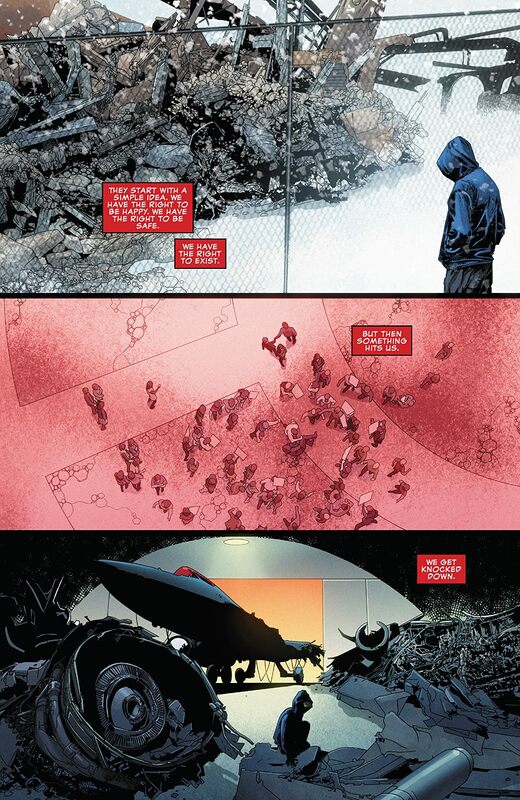 In an event aptly called “Death of X,” Scott Summers met an inglorious end at the hands of the Terrigen Mists, the alien gas cloud that gives the Inhumans their powers. 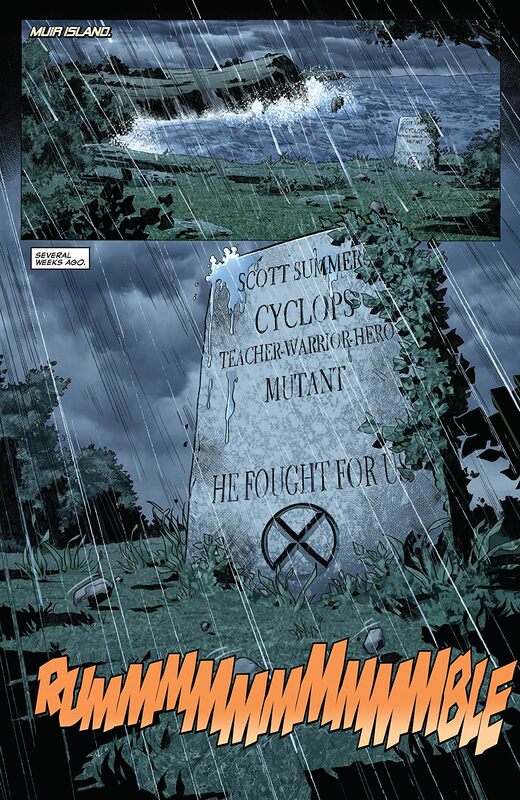 His death had a major impact on the overall landscape of the X-men and very little of it was good. 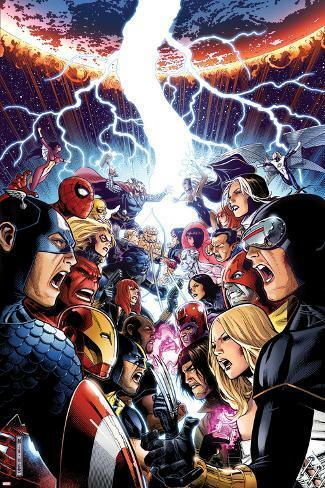 In the same way that the Avengers aren’t the same without Captain America and the Justice League isn’t the same without Superman, the X-men just aren’t the X-men without Cyclops. 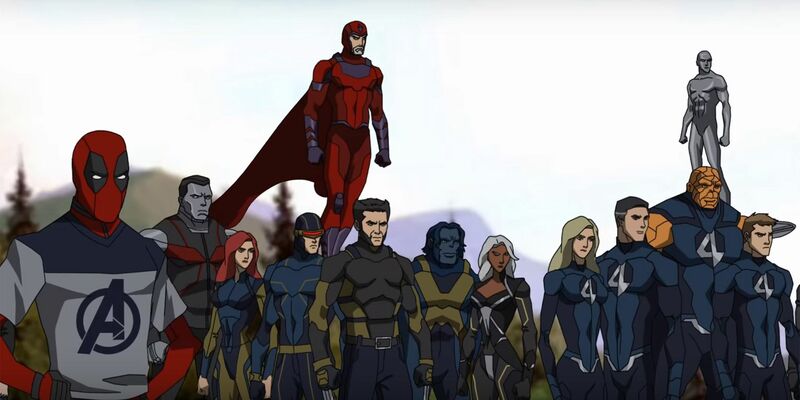 He’s literally been with the X-men since the beginning and there’s just something missing when he’s not there. 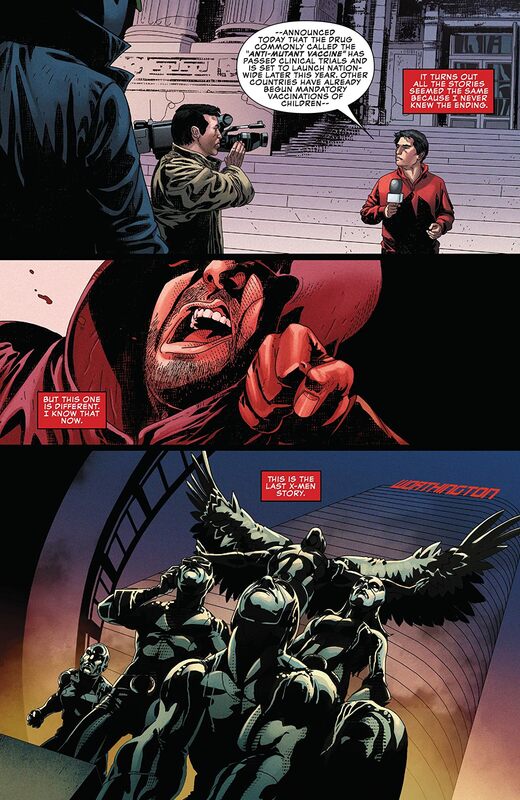 Writer, Ed Brisson, makes it a point to highlight this throughout the issue. 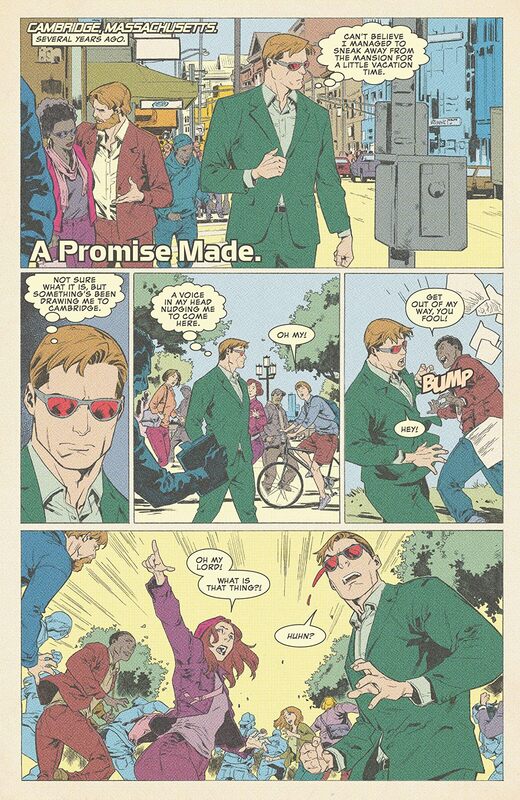 Aside from just telling the story of how Cyclops came back from the dead, he takes some time to demonstrate why he’s the leader of the X-men. He even puts him in a position to show why he’s a hero and why other heroes follow him. Without spoiling too much, the story builds beautifully off the events of both “Death of X” and “Extermination,” which is another brilliant X-men story by Mr. Brisson that I highly recommend. 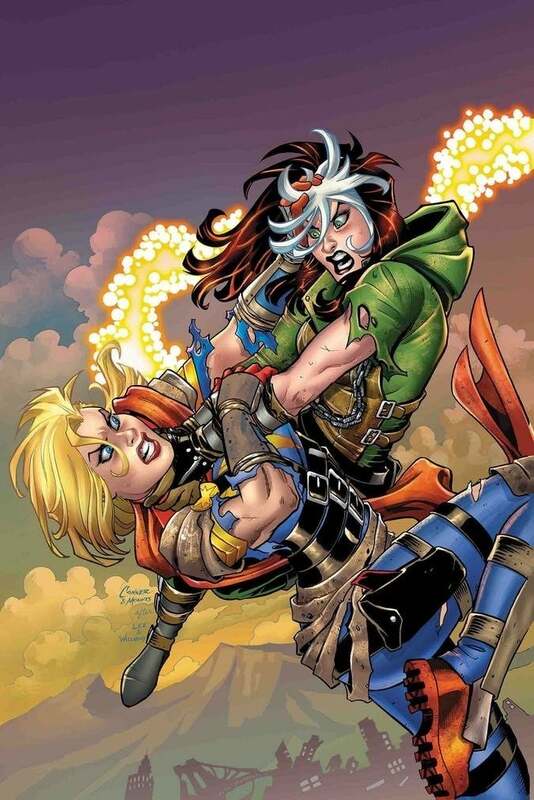 It even references moments from “Phoenix Resurrection,” another story I’ve given high praise. The connections and details in this comic fit beautifully. It shows that there was a lot of effort and thought put into this story. 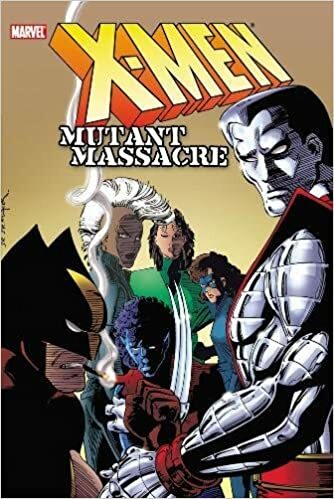 Beyond making appropriate connections to recent continuity, the story checks all the right boxes in terms of telling a quality X-men story. It even checks some extra boxes in terms of showing a character at his best when they sorely need it. Cyclops is one of those characters who always seems to generate heated debates among X-men fans. He’s also someone a long list of talented Marvel writers have mishandled over the years. The fact he’s part of the worst love triangle of all time is proof of that. This issue cuts through those complications and just gets to the core of what makes Cyclops great. This issue is one of those comics that will definitely have a ripple effect for future X-men comics. 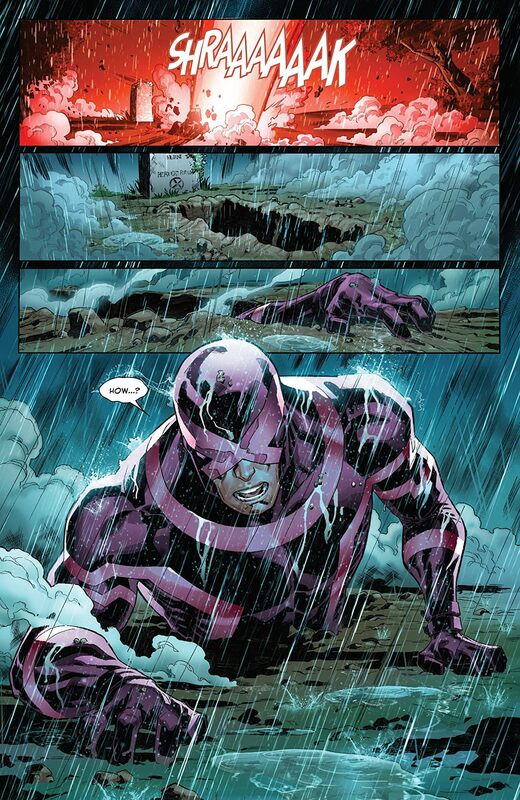 Any time a major character comes back from the dead, which happens a lot in X-men comics, it’s a big deal. It often marks a turning point for the course of the story and lays the groundwork for the future of the series. By the time you finish “Uncanny X-men Annual #1,” you really feel as though you’ve just witnessed one of those turning points. On top of that, there’s a sense that this character who has been so maligned over the years for all the wrong reasons is back to his old self. If that doesn’t get your inner X-men fan excited, then you’re just being difficult. 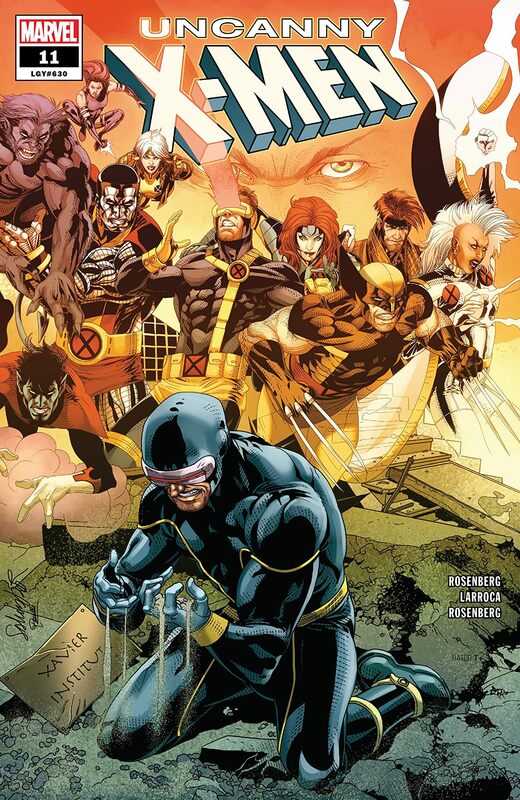 For Cyclops fans, X-men fans, and Marvel fans in general, “Uncanny X-men Annual #1” is one of those rare books that actually gets you excited about the future. At a time when you can’t go more than a day without something terrible trending on social media, that’s worth the price of a comic book. Say what you will about these tumultuous times. 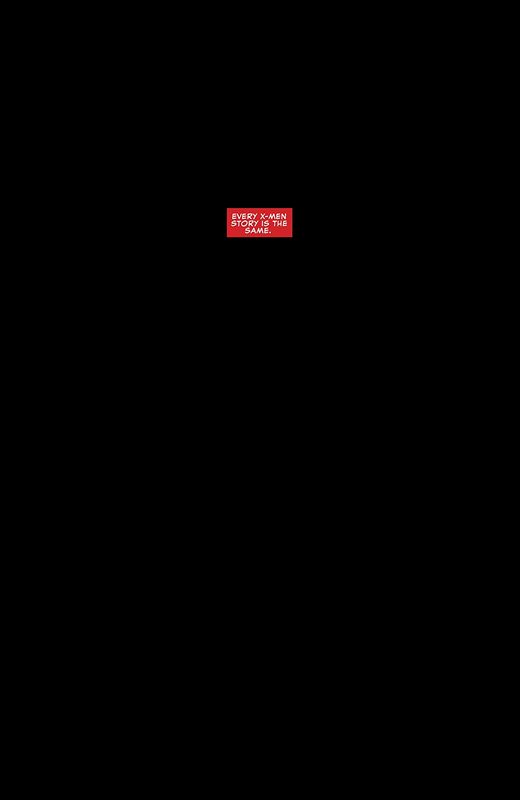 One thing is still clear. It’s a damn good time to be a fan of Black Panther. Whether you’re a long-time reader of the comics or Chadwick Boseman enjoying a meteoric rise in fame, these are the best of times for T’Challa, Wakanda, and everything in between. 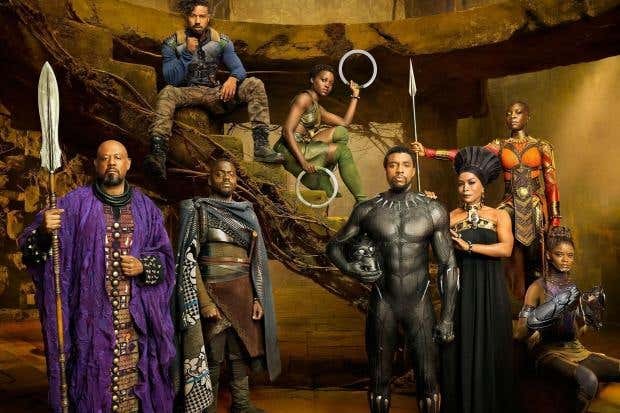 As of this writing, the “Black Panther” movie has topped $700 million worldwide in just over a week since its release. It’s well-poised to cross the $1 billion mark that only a handful of movies have reached. Things are going very well for Black Panther is what I’m saying. I cite all this good news surrounding Black Panther because what I’m about to discuss is not going to show him in the best of light. None of it detracts from the character, nor does it undercut the remarkable achievements that the “Black Panther” movie has accomplished. Given the promising future of Black Panther’s future, though, I think now is probably the best time to bring it up. Once again, it has to do with superheroes and romance. Long-time readers of this blog probably aren’t surprised by that in the slightest. I talk about superhero romances a lot, citing instances where those romances embody the best elements of a love story and those that are inherently flawed. I’m afraid this is going to be about the latter. Black Panther is a great character and has a lot of things going for him, right now. Between a successful movie and a successful ongoing solo series, which you should definitely check out, he has a lot has gone right for him. Unfortunately, that does not extend to his love life. To those who only know T’Challa through the “Black Panther” movie, I’m not referring to Nakia, who is his primary love interest in that story. I’m referring to a much higher-profile relationship he had with a much higher-profile character in the mid-2000s. 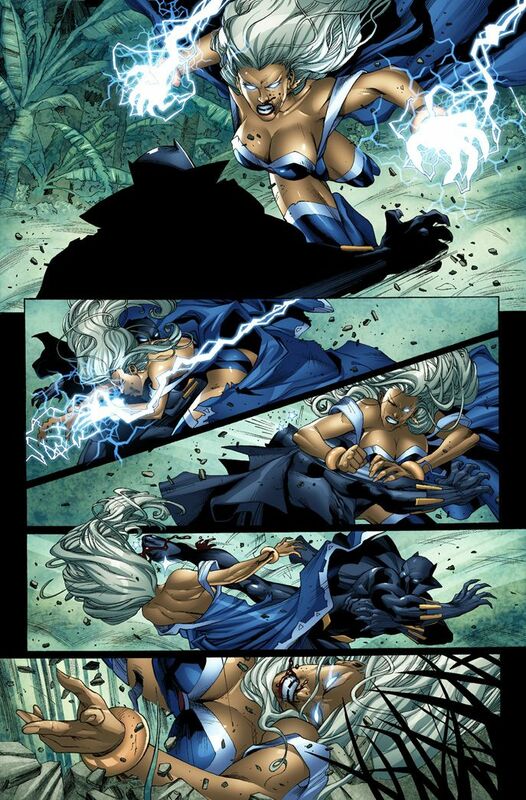 That character is Storm, a character I’ve praised before and not just for her love of foreplay. It’s true. 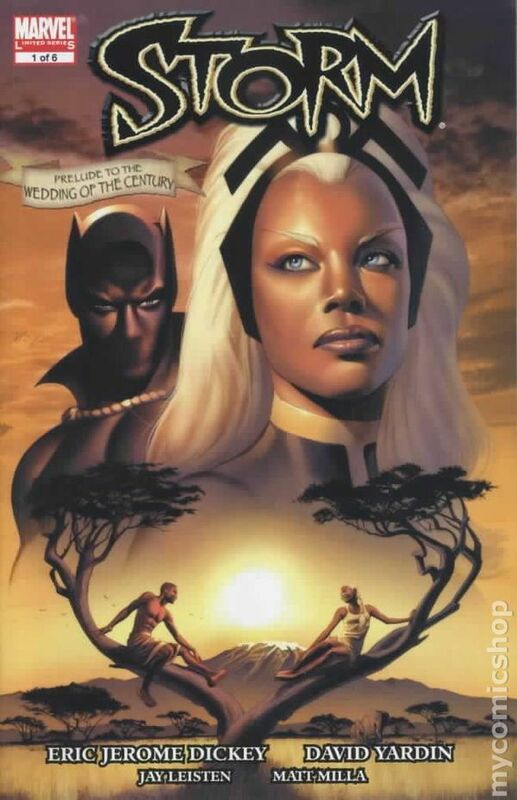 In Black Panther Volume 4, Issue 18, which came out in 2006, Storm and Black Panther got married in what was billed as the highest-profile superhero marriage since the wedding of Cyclops and Jean Grey. It even managed to temporarily stop the ongoing hostilities in Marvel’s now-famous Civil War event. 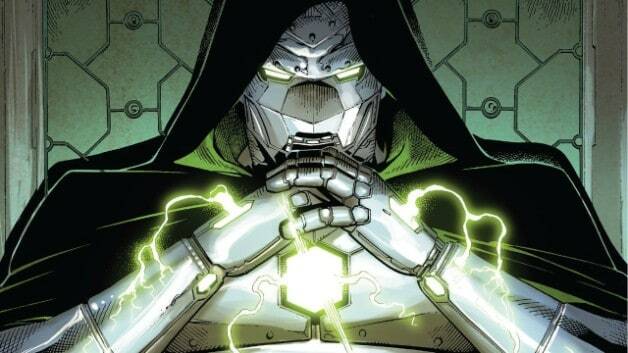 On paper, it was billed as the union between two of Marvel’s most prominent black superheroes. It was presented as a union between a weather goddess and a king. It couldn’t have had more going for it without being the central plot of a Disney movie, which isn’t impossible at this point. There’s just one glaring, omega-level problem with that approach. The relationship between Storm and Black Panther is one of the shallowest, emptiest, and least compelling romances in the history of superhero comics. Yes, it’s even worse than the time Juggernaut had a fling with She-Hulk. For two character who are so iconic, well-rounded, and endearing, that’s quite a statement. I imagine that more than a few people disagree with it, but there’s a reason behind that statement and it’s not an overly petty one. Between being a die-hard fan of superhero comics and an aspiring erotica/romance writer, the flaws in this relationship stand out more than most for me. The most glaring flaw, by far, is just how forced the relationship was in the first place. 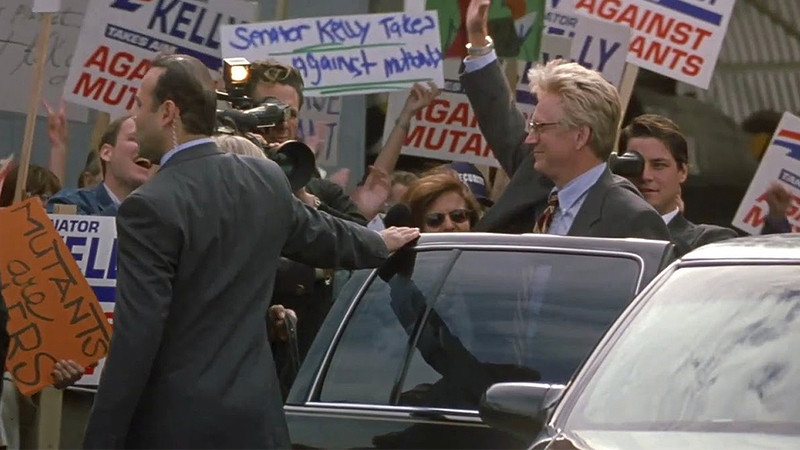 I won’t say it was quite as bad as the relationship between Jean Grey and Logan was in the X-men movies, but it was pretty damn close. From the beginning, it was less about the chemistry between these two characters and more about the fact that they were two prominent black superheroes. Never mind having an actual reason to want to be together. Never mind actually tying their respective stories together in a compelling way. The approach was as lazy as it was empty, essentially relying on the iconic status of both characters and nothing more. By that logic, Taylor Swift and Ed Sheeran should’ve gotten married already. Even if the approach was lazy, the premise could’ve worked if there was time and effort into developing the Storm/Black Panther romance compelling. Sadly, that’s not the approach Marvel used. They were in such a rush to get these two married that they skipped the part where they told a dramatic love story that brings these characters together in a meaningful way. As a romance fan and a comic book fan, that was as satisfying as food poisoning and a hangover. Instead of presenting valid reasons as to why these two characters should be in love, Marvel rewrote Storm and Black Panther’s history to establish that they met each other when they were young and shared a strong connection. That’s all well and good, but there’s one glaring problem. By rewriting the past, it devalues the emotional depth in the present. Instead of actually building that depth, it’s just suddenly revealed that these two characters had a long-standing history. There’s no need to tell a more elaborate story. It already happened in the past and they’re only acknowledging it now. If I could write that with more sarcasm, I would. Now, history being rewritten in comics is nothing new. That’s what comic fans refer to as a “retcon” and it’s basically the narrative equivalent of a mulligan. When used correctly, it can help clear up convoluted elements. When used poorly, however, it can be very destructive. 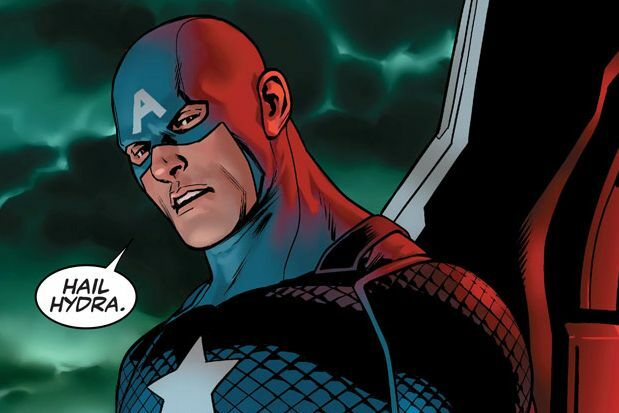 Just ask Captain America fans. A retcon is the ultimate contrivance and that was the foundation of the Storm/Black Panther relationship. If every good relationship starts with a strong foundation, then the Storm/Black Panther relationship was built on a mix of quicksand and moldy bread. I get the intent. 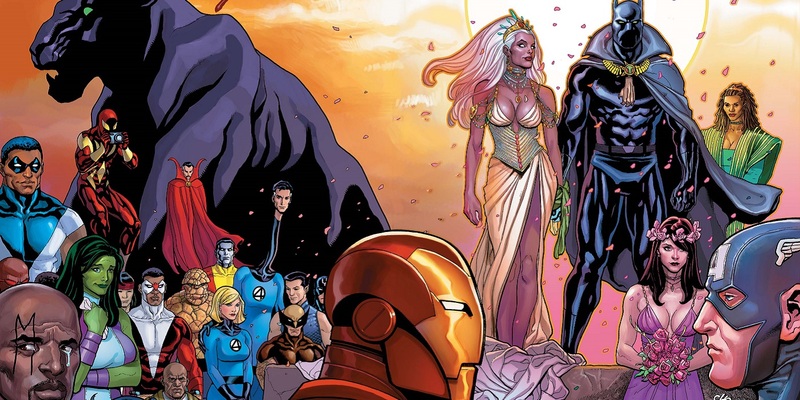 In order for Storm and Black Panther to get married, they needed to establish that their relationship was somehow worthy of being on the same level as Superman/Lois Lane or Mr. Fantastic/Invisible Woman. Unfortunately, the only way to do that is to rewrite their entire history so that their love was something that had depth. It just happened entirely behind the scenes. Contrast that with the love story we saw in the “Black Panther” movie between T’Challa and Nakia. There was nothing contrived about that story. These two characters both had their own narrative. In pursuing that narrative, they came together in a way that felt organic, genuine, and sincere. It was probably the most sincere love story in a superhero movie since the original Deadpool movie. That shared narrative has huge gaps with Storm/Black Panther and not just because it required a rewriting of their respective history. Even before that retcon, Storm and Black Panther followed very different narratives. Storm, since her debut in 1975, has been an integral part of the X-men and their story. She was a key player in some of the most defining moments in X-men history. Along the way, she’s had various romantic relationships with the likes of Bishop, Nightcrawler, and Forge. For a time, she had a pretty passionate relationship with Wolverine. The fact she had all those relationships while Black Panther had plenty of his own, most notably with former Captain Marvel, Monica Rambeau, makes the idea that they shared this powerful bond in their youth seem not so powerful. Even if there were other forces pushing them apart, the fact they followed such distinct narratives really undermines the sincerity of their relationship. It also makes for some pretty distressing implications. Throughout the X-men’s history, the team has been on the run and on the brink every other week. In some cases, it led to some pretty brutal tragedies. All these things were happening with the X-men and Storm was often on the front lines. The fact that she and her friends struggled so much while T’Challa, king of the most advanced nation in the Marvel universe, never did a goddamn thing to help her or her friends just makes the situation even worse. 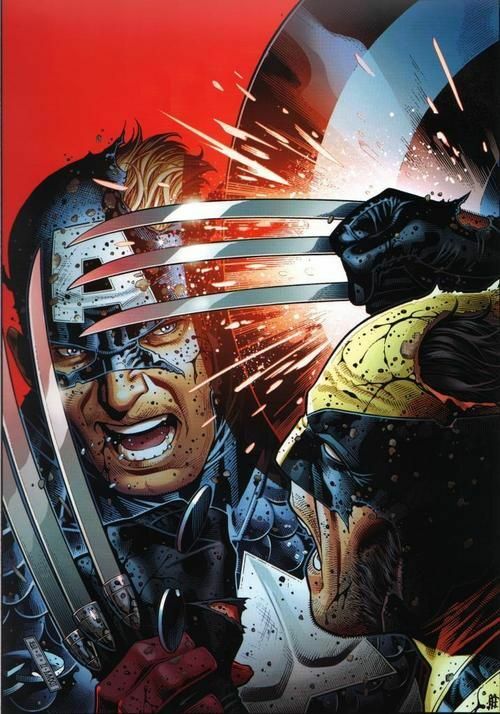 Unlike Wolverine or Forge, he wasn’t there to share in all the struggles. 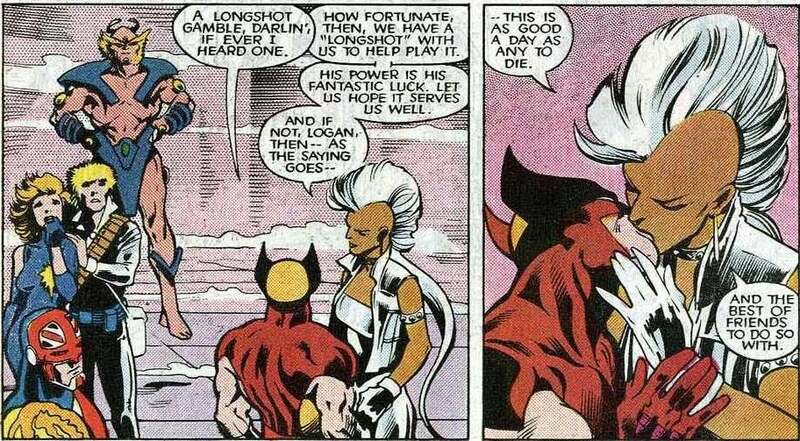 Granted, T’Challa had his own struggles, but neither he nor Storm ever went out of their way to support one another. Sharing struggles is one of the most important components of a believable, functional romance in both the real world and in superhero comics. Without that, it’s like trying to build furniture without a hammer. You can try, but if you don’t have the right tools, the results are going to be limited at best. 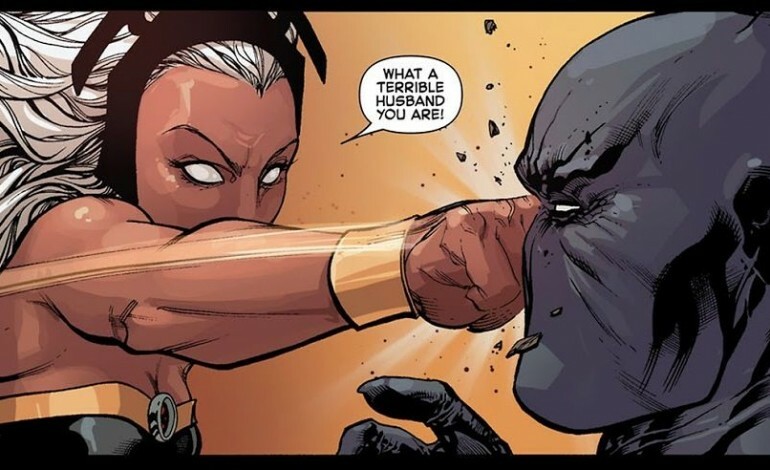 It’s the fact that Storm and Black Panther shared such different struggles that their marriage in the comics ended in a fairly ugly fashion. 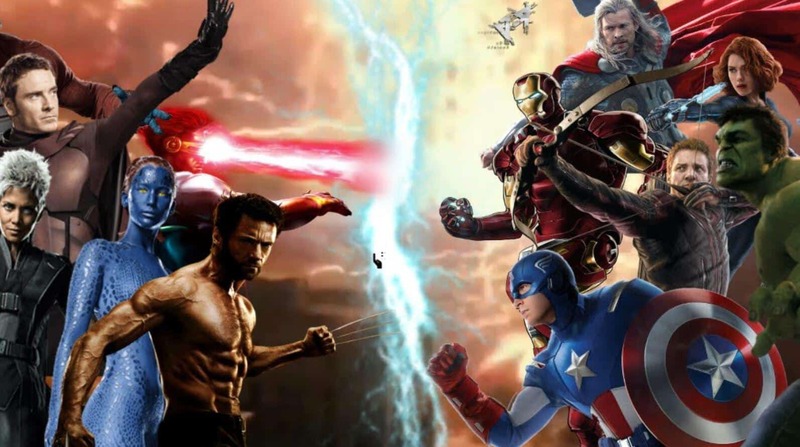 When the Avengers and X-men clashed in the aptly-named “Avengers vs. X-men” event, Storm and Black Panther were on opposite sides. The conflict was so bad that it left Wakanda in ruin and by the end, their marriage was annulled. It was an inglorious ending to a romance that Marvel tried hard to make iconic. Unfortunately, they went about it in all the wrong ways for all the wrong reasons. There’s no question that Storm and Black Panther are among Marvel’s highest-profile black heroes, even more so now with the success of the “Black Panther” movie. That’s still not the sole reason why they should be romantically involved. The relationship was so forced and so flawed that even the X-men’s most iconic writer, Chris Claremont, says the whole thing was a big mistake. Storm and Black Panther may have potential, but by forcing it and rushing it to such an egregious extent, it’s hard to take that romance seriously. If nothing else, the Storm/Black Panther relationship should provide a cautionary tale for superhero romances and real romances alike. Most importantly, it reinforces the notion that genuine romance can’t be forced. Strong couples share in their respective struggles, supporting one another and guiding one another. Storm and Black Panther did none of that. Marvel’s approach to forging their relationship only gave them more reasons not to be together. Both characters have a bright future in their own respect, but that future cannot and should not be forced or contrived.